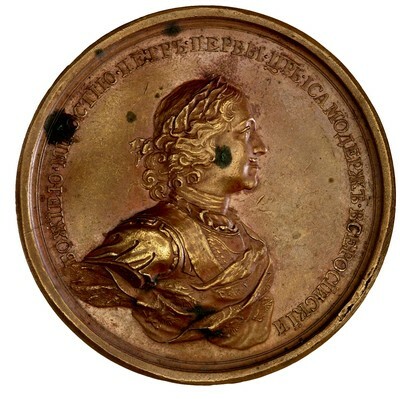 Obverse: [In Russian]: BY THE GRACE OF GOD PETER THE FIRST TZAR AND ABSOLUTE MONARCH OF ALL RUSSIA - Bust of Peter I, laureated, draped, and cuirassed, r.
Symbol: in the shoulder of bust: M.K. Symbol: above exergue line, at r.: M.K. 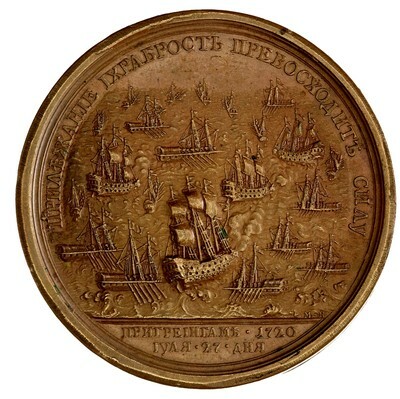 Note: This medal was struck to commemorate the Battle of Groenhamn that took place on 27 July 1720. ANS specimen is a 19th-century copy by Mikhail Kuchkin that deviates from designs of the original die-stamps executed by an unknown die-cutter.